In what may have been a first in live storytelling, close to 200 people listened to tales of Latin America performed with subtitles during a Feb. 5 benefit for Radio Ambulante. Producers of the long-form narrative radio show took to the stage of Instituto Cervantes New York to give a sold-out crowd of supporters a sense of what Spanish-speaking listeners are in for in the coming months. Two Latino literary heavyweights appeared in the show — both Francisco Goldman and Junot Díaz are personal friends of executive producer Daniel Alarcón — but it was a story told by Alarcón’s father Renato that stole the limelight. The elder Alarcón donned a Peruvian National Soccer Team jersey as he recounted how he wowed an audience at a municipal theater in Peru by doing play-by-play of an imaginary soccer game. Now a “semi-retired” physician, Renato Alarcón was 13 when he played a sportscaster before a live audience. As he recreated the performance, the sound bed of a roaring soccer crowd gave way to the cheers of Radio Ambulante fans. Some of New York’s leading pubradio producers also turned out for the event. Democracy Now’s Amy Goodman, Marianne McCune of New York’s WNYC, Sarah Kate Kramer of Radio Diaries and Maria Hinojosa of Latino USA were on hand to rub elbows with Alarcón and Radio Ambulante’s New York–based editor Annie Correal. Annie Murphy, a former Latin America–based freelance radio correspondent who now teaches at the University of California at Berkeley’s J-school, and Martina Castro, managing editor of KALW News in San Francisco, came from the West Coast. Radio Ambulante needs to raise $250,000 to $300,000 to cover production of biweekly stories for the next year. Instead of producing hourlong shows built around thematic topics, the team will shift to a shorter format that can be easily adapted for radio broadcast. Castro approached KALW General Manager Matt Martin in fall 2011 and convinced him to provide workspace to the fledgling radio production. “Even though we don’t air a single minute of Spanish-language radio, he knew that this was a project that deserved a home and some help,” Castro told Current. KALW will air an English Radio Ambulante special March 28 and offer it for broadcast on other pubradio stations. The special includes a story about an ultraconservative Hispanic Republican character created by the Chicano cartoonist Lalo Alcaraz, and also features a Chilean poet who named buildings for real estate developers. The piece on the Chilean poet was featured in a recent episode of 99% Invisible, an independently produced radio show and podcast that’s also affiliated with KALW. When regular production of the Spanish-language program commences, Radio Ambulante’s team hopes to secure carriage for it on radio stations around the Spanish-speaking world, but they’re not yet able to discuss details. Radio Ambulante’s founders have cited This American Life, Radiolab and Snap Judgment as examples of the kind of storytelling magic they hope to deliver to Spanish-speaking listeners. The show takes its name from street vendors, “ambulantes,” found in cities throughout Latin America. Executive director Carolina Guerrero says producers expect to distribute one standalone story every two weeks starting in late March. Podcast versions of each story will be 10–15 minutes long, and each piece will be edited to 10 minutes for radio broadcast. Some 35 stories are currently in production from correspondents around Latin America, the U.S., Australia and Spain. This article has been revised. 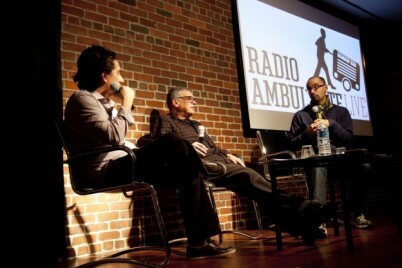 An earlier version reported that as many as seven public radio stations in the U.S. will air KALW’s English-language Radio Ambulante special. As of Feb. 27, no other stations had scheduled the show, according to Martina Castro, KALW managing editor. This article was first published in Current, Feb. 25, 2013. Roman Mars is a hero, there’s a problem with dude overload, and more.